(Bloomberg) -- A fresh warning from Kim Jong Un -- coming just as South Korea’s Moon Jae-in arrived in Washington to meet with U.S. President Donald Trump -- placed new urgency on the allies’ efforts to restart nuclear talks. The North Korean leader urged top ruling party members Wednesday to deal a “severe blow to hostile foreign forces” by resisting sanctions against the country, according to the official Korean Central News Agency. 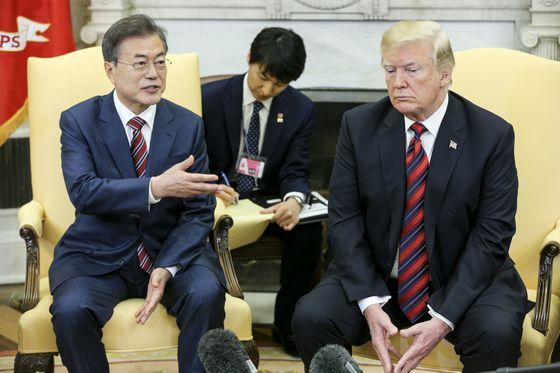 While the report included no direct threat of action, it underscored Moon’s challenge in finding common ground between Kim’s demands for economic relief and Trump’s insistence on greater disarmament commitments. Moon hopes a direct appeal at the White House on Thursday can keep his efforts to build a lasting peace on the Korean Peninsula from slipping away after Trump walked away from his summit with Kim in Hanoi. Not only would new provocations put Seoul back at risk, Moon has staked much of his presidency on building ties between South Korea’s closest ally and its increasingly well-armed rival. Moon’s administration raised expectations for a deal before the Feb. 28 meeting and was caught off guard when the two leaders left Vietnam without an agreement. His approval rating fell to a record low of 41 percent last week, according to Gallup Korea, compared with 83 percent in the wake of his first meeting with Kim last April. One U.S. administration official said Wednesday that Trump liked Moon, but believed that the U.S. president and Kim were best positioned to mediate their own relationship. Trump wasn’t convinced that the South Korean leader could bridge the divide after the collapse of the Hanoi talks, said the official, who asked not to be identified discussing the president’s thinking. South Korean Foreign Minister Kang Kyung-wha, who is with Moon in Washington, will meet U.S. lawmakers from a congressional Korea study group next week in Seoul to discuss developments on the peninsula, the ministry said. An immediate concern is discouraging Kim from any actions that could provoke Trump. North Korea is planning to celebrate the birth of its founder -- Kim’s grandfather Kim Il Sung -- on Monday, an occasion that the regime has sometimes marked with shows of military might. Last month, a top North Korean diplomat told reporters that Kim would decide “in a short period of time” whether to continue his freeze on bomb and missile tests. Kim’s latest remarks came during a Workers’ Party of Korea gathering in Pyongyang, in which he stressed the need to maintain “self-reliance” in the face of foreign economic pressure. North Korea has so far ignored South Korean requests for working-level talks, briefly withdrawing officials from a joint liaison office and criticized Moon’s government for supporting U.S.-led sanctions and military drills. The moves signaled that Moon’s achievements since signing a joint declaration with Kim in the demilitarized zone last year could unravel without action. Getting talks back on track may require progress on two fronts: Convincing Trump to accept incremental steps short of “complete denuclearization” and getting Kim to agree to an end goal. South Korean officials have expressed the need for a “good enough” or “early harvest” deal that can build momentum -- without elaborating on what such an agreement would involve. That’s where Moon risks opening a rift with Trump. While the U.S. leader has expressed a desire to maintain his “very good relationship” with Kim, his decision to leave the Hanoi meeting empty-handed signals that he needs a more significant concession than the aging nuclear plant North Korea was prepared to give up. Moon will probably use the meeting to continue to press for relaxing sanctions to resume stalled inter-Korean economic projects such as joint factory park and mountain resort -- even through waivers could be revoked. The U.S. has so far been cool to the proposal, which would provide the cash-strapped regime with a jolt of foreign currency.